Paradise Coast Hearing Care in Naples, Florida is proud to offer Starkey hearing aids and devices. Starkey’s hearing instruments represent the most advanced hearing technology available today, and feature industry-leading wireless capabilities. Starkey offers a complete product lineup covering all technologies and suitable for all lifestyles. Starkey offers noise reduction technology that delivers clear sound even in the noisiest situations. With a variety of styles (Invisible, Behind the Ear, In the Canal, In the Ear, Receiver in the Canal, etc.) and color options, Starkey has great options for many patients. Durable and Dependable – Surface™ NanoShield, our pioneering water, wax and moisture repellent system, to protect and ensure durability and dependability. 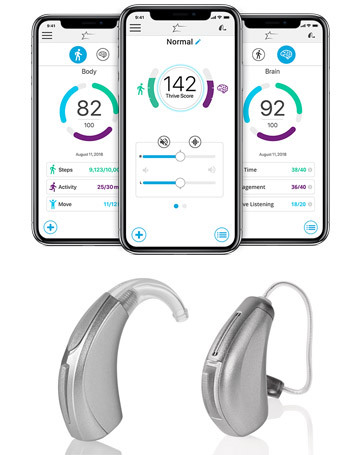 Smartphone Compatibility – The Thrive Hearing Control app lets you easily connect your Livio and Livio AI hearing aids to your Apple and Android devices.